it was raining hard the night before and was still raining through the midnight in some parts of the city. i woke up at precisely 4:51am in the morning - opened the curtains and try to get back to sleep almost sitting up due to the stuffy nose. awoke suddenly moments later by the bluish of the sky through the window. grabbed my camera still under the influence of nyquil and took some pics of the city at daybreak. 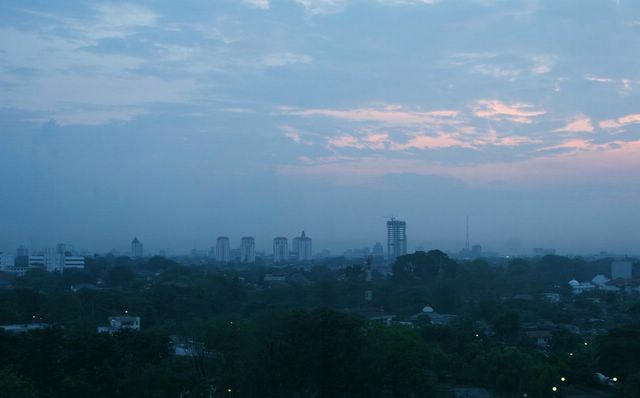 jakarta -- in the calm of the early morning -- not bad at all. hmm..siap-siap aja bentar lagi bikin foto jakarta kebanjiran ;p dah musim ujan nih..